Your Crexendo expert PPC manager will get the most out of paid search for your company. Our PPC management team will utilize all 3 major platforms, not just Google. While Google has the biggest market share, Microsoft adCenter and Yahoo are still a major part of our PPC management company. Expand Your Reach – Display your product or service to as many as 43 million potential customers, including searches on Bing. Lower Cost Per Click – Yahoo has less competition so CPC is lower. Target Your Audience – Microsoft adCenter allows you to target market segments by age, gender, geography, day and time, and more. 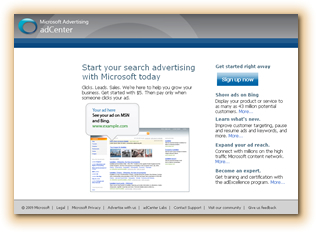 Your company should have a PPC manager with expert knowledge in every major PPC platform, including Microsoft adCenter. While the 3 major platforms are all similar, each has its own idiosyncrasies that your expert Microsoft adCenter manager needs to address in order to maximize results. Find out why Crexendo’s Microsoft AdCenter management services are a perfect fit for your agency. Fill out the form above to receive your FREE competitive web site analysis!